Born 1943 in Indonesia and educated in Singapore, Tan Swie Hian graduated from the Department of Modern Languages and Literature of Nanyang University in 1968. He is now a citizen of Singapore. 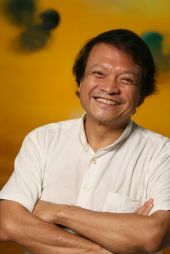 Before venturing into the field of visual arts, Tan Swie Hian earned his fame through literary writings and established himself as the leading light of the modernist Chinese literature in Singapore following the publication in 1968 of his first poetry anthology The Giant, the first of its genre in the country. In 1973, Tan held his first solo exhibition Paintings of Infused Contemplation at the National Library. Since then, he has been a prolific multidisciplinary artist whose works extend across multiple mediums, genres, languages and subject matters. In 2003 TIME magazine in a feature described him as “Singapore’s Renaissance Man”. Recognised as a cultural icon in Singapore and the top-grossing living artist in Southeast Asia, Tan Swie Hian has so far published 60 works of literary and artistic creations, held 25 solo shows worldwide and won 29 accolades nationally and internationally.